Novell was never going to die in one big go (these companies never do) but it is gradually bleeding to death and is not in a great position to ride out the current climate. I know everyone has been laying people off, but Novell have been having large rounds of layoffs for several years now and the situation hasn’t improved. From their deal with Microsoft that puts Microsoft in the driving seat, their complete inability to make anything out of the open source software that has dropped into their lap to the bleeding of their Netware, eDirectory and Groupwise businesses in favour of Windows Server, AD and Exchange – that other posters have pointed out here for years – the prognosis is looking terminal. Over here in the United Kingdom, Novell is obviously suffering quite badly. The country's affairs with Microsoft (statistically much higher than the rest of the world) might have something to do with it. Siruis, a UK-based company, had previously defeated Novell and it did this again thanks to Debian GNU/Linux, the poster child which was conceived by a Brit, Ian Murdock. Here is a new report about it. “We had one client who moved from a Novell/Microsoft-based environment to a Debian-based one and they saved something like 80 percent of the cost in the first year – they couldn’t have done that moving to Red Hat – not when their licences cost £1000,” Callway said. He added that Sirius was set to announce a major educational project that would show the extent to which open source software was becoming more accepted. Novell UK is in ruins, based on our sources. Jacqueline de Rojas still works around Novell in the vicinity of Europe (in the Operation side) and she was responsible for this role until recently (she has run the UK/Ireland operations since 2007). Novell’s business in UK/Ireland is now considered a total failure, however, as Microsoft has taken a lot of municipal projects, deployments, and contracts from Novell (GroupWise, Netware, etc). This could easily be seen across various UK news outlets and Groklaw pointed this out at least once in 2008. We gave many examples over the past couple of years, so there is extensive solid evidence. This week’s news serves as a reminder of Ray Noorda’s newly-coined term, “co-opetition”. It’s truly a shame that Novell's new management is doing such co-opetition with a company that Noorda could not stand. The late Ray Noorda, founder of Novell, coined the word “co-opetition” to describe these sorts of deals, where competitors sometimes find it sensible to actually work closely together for the common good. Sometimes, as in this case, customers seem to win as well. Not sure why Ian Murdock would be considered a Brit (born in Germany, resident of the States). Perhaps his parents are British? Oops, I thought he went to British university, but I’m probably confusing him with someone else. SUSE is just another failing Microsoft product. Can you please explain what patent tax? Novell has not raised prices on Suse AFAIK, so is this a tax that is in name only? See this post from Shane. How did the deal put Microsoft in the drivers seat? Yes, they have done absolutely nothing for open source software, never given back to the community, and Suse hasn’t been upgraded since version 9.2. That was sarcasm by the way. to the bleeding of their Netware, eDirectory and Groupwise businesses in favour of Windows Server, AD and Exchange – that other posters have pointed out here for years – the prognosis is looking terminal. Ah, probably the only bit of truth in the otherwise nebulous cited post. 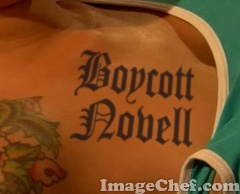 This is the problem Novell has. It has been the problem since Exchange began to gain in popularity. Exchange and Windows mean AD. That vendor lock in is what is doing Novell’s proprietary business in right now and you could say that marketing and sales have been a no-show as well. Cash. They got (much needed) cash for the “IP” that MS was using without license. And all it cost them was the loss of some of the street cred they got from buying suse and ximian (not from any inherent street cred). But that was mostly with people who don’t write the cheques anyway. Novell could really use (if not depend on) this cash at the time. And, please, let us recall what Symbolset had pointed out – that Novell had problems with their SEC filings, which caused them to potentially have to pay back cash that wouldn’t have been due till 2024 otherwise. Lots of cash, apparently. Funny thing, they seem to have filed that 8-K asking for an extension until the close of business on the day that the MS deal was to be announced. Coincidental? Interesting that Sonsini had snuck in there. See this update.